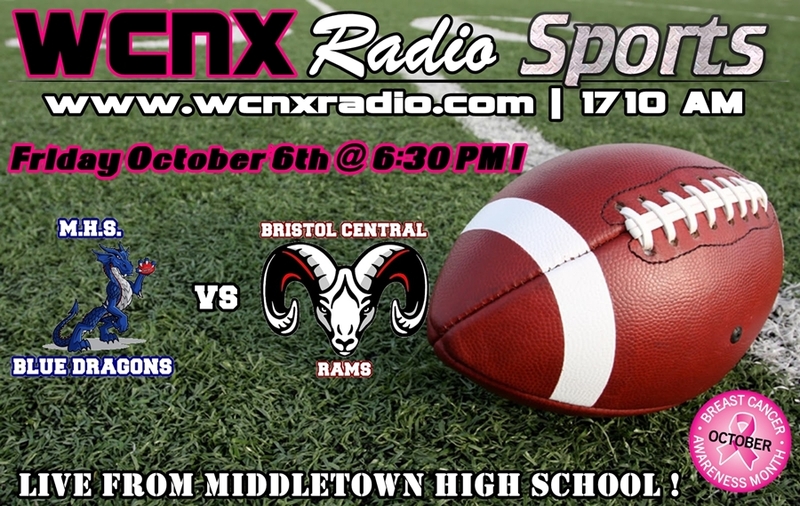 The Middletown Insider: The Middletown High Blue Dragons Take On The Bristol Central Rams Tonight! The Middletown High Blue Dragons Take On The Bristol Central Rams Tonight! It's that time of year when it's not too cold, and just cold enough for, you guessed it! Football! What's a better way to spend a Friday Night than to support the Middletown High Blue Drangons, as they take on the Bristol Central High Rams. The Rams come into this game 2-2, against Middletown's 4-0. You can never tell how a game'll be played by the stats. Bristol Central is known to be a tough team, and will surely not hand over any points to Coach Morello's Blue Dragons without a struggle. You can catch this game Live at Middletown High School, tonight, at 6:30 PM, or on WCNX Radio, at www.wcnxradio.com.